Last year to my shame I declined the chance to take one of my Brompton bicycles up to Sheffield for a gathering of the Northern branch of the London version of the Brompton Club. This year when the opportunity arose again, I was determined to attend. (Besides there is rumour that Sheffielder Phil Oakey, lead singer of the 80's group 'The Human League' still lives in the area)! Rising at an ungodly hour I cycled to a pickup location where David and Anne (who had risen even earlier) had parked their car. They had kindly offered me a lift with them up to Sheffield as travelling by train was more fuss than it was worth. We had a good journey up and the constant rain made me think that my big camera might not get out to take pictures. Thankfully by the time we got to Sheffield the rain stopped and we were to be very lucky for the entire day. The start for some of us was the Sheffield branch of 'Edinburgh Bicycle Cooperative' which had provided some funding along with Brompton themselves for a few goodies. Having a look around the shop I was left wishing that they had some branches in London! A quite brilliant bike shop! Riding the short distance to Sheffield Railway Station we met up with the much larger group of riders. In all I think that there were 28 of us. It was great to finally meet people who previously had been names on the screen of my iMac. It was also great to see some familiar faces like Mandy and Roy who I had met at the Brompton World Championships last year. The area in front of the station was perhaps one of the best looking I have ever seen. A wall of water ran down a metal curve and below that mini waterfalls neatly ran into a channel at ground level. Eventually I was able to contain my desire to take a photograph of everything that moved and stayed still and I listened to a brief prep-talk. With this done we were off. The sight of sizeable numbers of Bromptonians in a peloton is a sight to be behold at the best of times and I had a feeling that this was going to be a very good day. Many readers will know that I particularly like gritty industrial buildings from the past utilised in a different way in the here and now. It is perhaps why I love cycling East along the River Thames. I was hoping that Sheffield with its formidable industrial past would have such areas. Our guide for the day was Mick and he was very good! His knowledge was as extensive as it was interesting and every so often we would stop to listen to some information about our various locations. I would go as far to say that he could perhaps offer paid cycling tours. As we cycled along hints of the past were all around. In the distance every so often you would catch a glimpse of stunning views and higher ground. On Sunday, 6th July, Stage 2 of the second best cycling event in the world (Brompton World Championships begin first) the 'Tour De France' will visit Sheffield. It will come directly through and finish in Sheffield, entering at Midhopestones, taking in in High Bradfield, Worrall, Oughtibridge, Grenoside, Hillsborough and the Lower Don Valley before finishing at the Motorpoint area. One of the reasons for this is simple...hills. There are some incredibly demanding hills in the area and a YouTube search will provide you with footage of people who have attempted some of the inclines the Tour riders will endure. They are not for the faint of heart and lots of the big teams have already sent or are in the process of sending riders to recce the route. Our ride took us on some of the roads the Tour will ride on. Regular readers will know that I love hills. There is something about the challenge that appeals to me. The added bonus of occasionally overtaking a roadie and shouting out a hearty, 'who ho...lovely morning for it' is naughty but rather satisfying. With the London Classic not that long ago I was very well prepared for the hills we encountered which I enjoyed greatly. As I was ascending the hills in addition to trying to ensure I didn't drop my camera, thoughts turned to the amount of kit I had taken. I will have to make sure that I have edited this down to a minimum on some of the bigger rides coming up. After all this climbing we reached a lookout point that provided some stunning views. If I lived in Sheffield I suspect the route to this point would become a training run for me. I think I would have to work hard to convince my riding partner Andrew that it would do him good. We were told that the other side of the hills, out of view was the location where testing was carried out during WWII on the bouncing bombs of Dambusters fame. Also in the distance Hillsborough Stadium, the home of Sheffield Wednesday cold be seen. It was here that 96 people lost their lives and hundreds injured in what remains one of the worst football disasters. During WWII an anti-aircrafter battery was positioned at this location. Sheffield, like many major cities were a target of German bombers. On this day the only shots fired were from lots of Bromptonians cameras. Up there on the top, with that view and that fact I was in Sheffield it took a great deal of restraint to stop shouting out aka Game of Thrones Style, 'I'm the King of the North!!' I am glad that common sense prevailed and I merely said it in my head...loudly. Being located within the valleys of the River Don and its four tributaries, the Porter Brook, Rivelin, Sheaf and Loxley water is something we were never too far from. Along the industrial parts of the River Thames any building still standing has been or is in the process of being converted into flats, shops etc. On our travels I could not see too much evidence of this happening but I am sure it is going on. In one stretch of water there was even a chap fly fishing and looking as if he had fought something. I suspect that a few years ago this would not have been possible. If it was anything like the Thames many years ago, you would have been more likely to catch cholera than a fish! As we headed into the city centre more evidence of industrial Sheffield begin a target during WWII could be seen. In the picture below you might just be able to make out a repair in the roof of the arch made by a German unexploded bomb. Luncheon was at 'The Fat Cat' pub. I am no frequenter of pubs but I do have a soft spot for Victorian pubs in the East End of London that have not had the pub-chain makeover. Sadly, lots of these are now themed establishments and any character lost to time. This pub had plenty of character and the food was very good! I opted for mushroom and spinach pie. 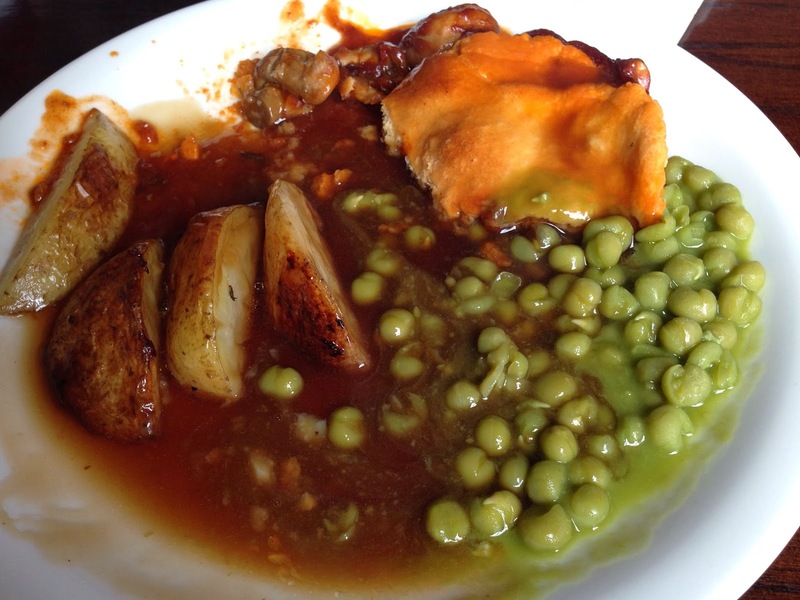 The gravy had a special local sauce which was also brought round in bottled form. (I must get the name of it and a bottle as it was lovely)! With empty plates all round we headed off again. Stoping at Kelham Island we heard more about the areas industrial past. The old and the new sit side by side and as you can see in the pictures new developments are never too far away. In the middle of what is surely to be a new development of office, flats, shops etc.., is a lone nod to the past. 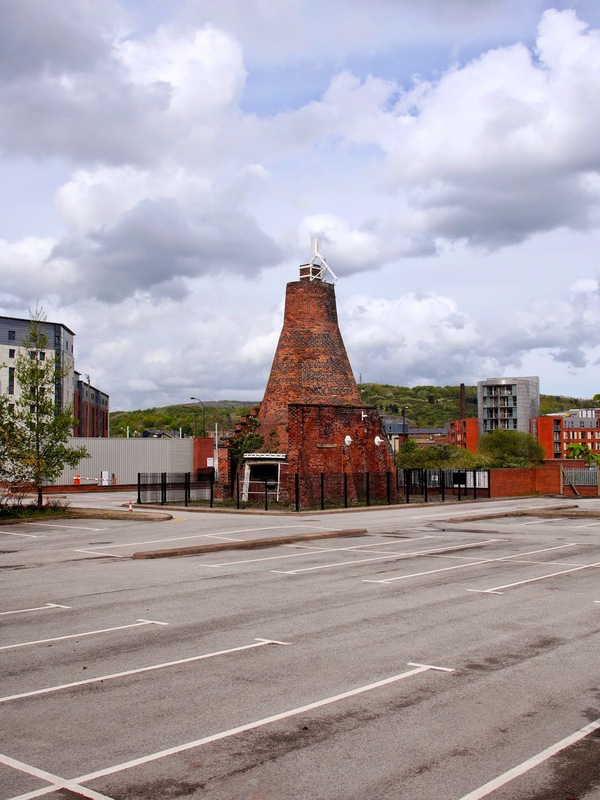 The chimney structure is the last of many similar structures where stye world famous Sheffield steel was produced. It was fired for the last time in the 1950's and one my one they have disappeared. I certainly hope that this one can be preserved as it would be a tragedy if it were lost. The white structure on top of the chimney was added during WWII to stop German bombers from seeing the glow of the chimney. As I have already written, Mick's knowledge was great and his passion for his city shone through. I was very pleased to see several Methodist buildings on our travels and I could not resist taking a photograph of this particularly fine example. As we cycled thought the Fargate shopping area there were some Morris Dancers. Sadly, they aren't seen as often as I would like and anytime that I do I cannot resist watching. On our war to the Botanical Gardens a lone cat was taking exception to a bunch of Bromptonians entering its territory. It wasn't best pleased I can tell you and the final insult was me taking a picture of it. The Botanical Gardens, opened in 1836 were charming and the Grade II listed pavilions reminded me of Kew Gardens but on a smaller scale. Well, there had to be a whippet! We stopped for a snack at the 'Shepherd Wheel' in Whiteley Woods which is a water powered grinding workshop dating back to the 1500's. Now fully restored it is in full working order and a survivor left to tell the tale of its industrial past. Cycling through, Weston Park we saw a few statues of significance. The first was a a memorial to 8,814 of the York and Lancaster Regiment who died in WWI. Just before heading back to the station we took one last look at the views. In the distance the mast on top of the hill marked the spot where we had been earlier in the day. We stopped briefly at Sheffield Town Hall and its adjacent Peace Gardens. I liked it a lot as I am rather fond of Victorian gothic. The fountain proved to be a great hit with children who darted in and out of the jets of water as they rose and sank. Sheffield is known as the greenest city in Europe as it has over 2 million trees and 83 parks. In addition to this we also paid a visit to the Winter Gardens. This contains hundreds of plants from all over the world and must be a fantastic place to visit in winter. I can imagine it being very popular with office workers. Our last two locations were some street art. The first, Harry Brearley credited with the invention of stainless steel and the second Sir David Attenborough. Both are rather striking and local artists Sarah Yates and Rocket01 respectively were commissioned to create them. Rather good if you ask me. Reaching the station we said our goodbyes and headed back to the car and London. A very big thanks to Alan from Edinburgh Bicycle Cooperative who organised the event. Also thanks to Edinburgh Bicycle Cooperative and Brompton for funding the bag of goodies - bottle, card holder, tyre levers, energy bar. 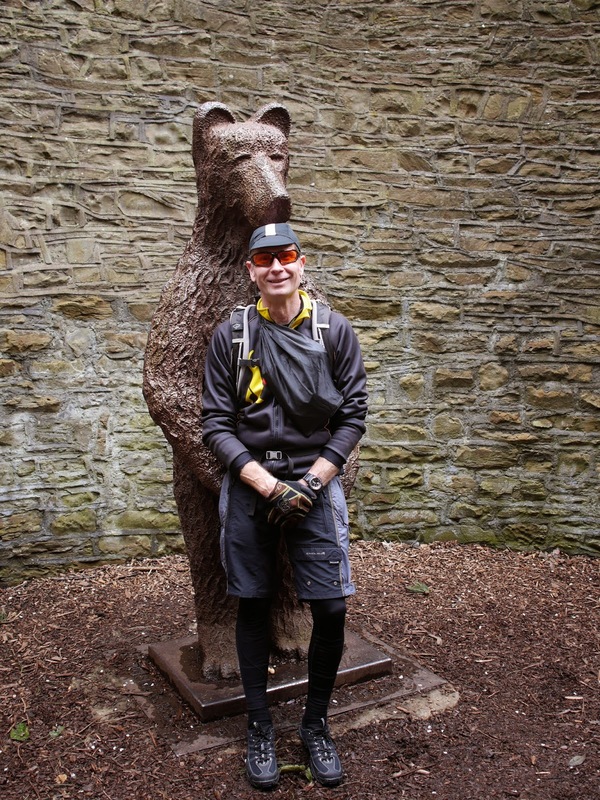 Thanks to Mick for his excellent guidance around Sheffield and to the other locals who helped Alan and Mick. Lastly, thanks to David and Anne for the lift. I liked Sheffield! There was a lots to see, plenty of history and a warm welcome. I have to say I was a little disappointed that I didn't see, meet and get the autograph of Phil Oakey but there is always another time. I hope next year another date is set for this event as Sheffield is definitely somewhere I'd like to return to. Below you can view the map and ride data. Great write-up and photos as usual Mr. O. I believe the sauce you enjoyed is called Henderson's Relish, as I recall Mick offering it to riders who were dining. Thanks for the lovely report, Mr. O. I, now, feel like I took a trip up there. Most impressed with your hill-climbing speed, Mr. O. Had you called "What Ho!" as you passed, I would not have had the breath to reply . . .
NightRider 2014 - Thank you!! Half a Million Page Views! !